This unorganized collection of links is a tiny fragment of what’s available on the internet — if you know how to phrase your search request. The spam-bots are quick to find my pages so I’ve turned off comments on everything except my blog. But I’d love to know if you find a great looping link or run across a broken link here. You can email me here. New Age Looping Study Group on Facebook. To post on the page, you must be a member, but you can see postings without joining Facebook or the group. DIY Waxed Linen Thread — a video I posted on YouTube. Excellent e-book on bilum technique and history. English-version PDF catalog from Bast, Rushes, Stinging Nettles: Textile Materials from the Stone Age. Reproductions by Anne Reichert. Thanks to Lucienne Kramer and Susi Nuss for this link. Looping project by Robin Taylor Daugherty first published, I believe, in Piecework. Thanks to Donna Sakamoto Crispin for this link. Looping project by Susi Nuss on Basketmakers.com. More fun links to follow, too! Video on cutting away an error in a naalbinding sock. Video on bilum making, showing the unique way they draw through the entire length of thread. Thanks to Donna Sakamoto Crispin and Poppy Hatinger for this link. This PDF of a 1935 American Anthropologist article, “Knotless Netting in America and Oceania,” has diagrams of several stitch variations. Nalbinding — excellent instructions and diagrams for Oslo stitch you can print out as a PDF. Left-handed instructions for lace netting. Right-handed instructions and more, too, from the home page. Excellent needle lace article by Jean Leader, with analysis on the structure of point de gaze technique drawn from study of museum collection. Calls the “away” needle orientation Continental Method. Looping on net floats. Thank you to Donna Sakamoto Crispin for this link. Russian Join technique for adding thread, from Knit Picks. 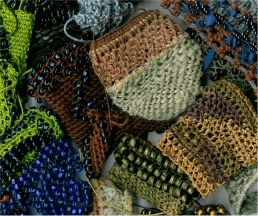 Wired Needlelace Elements for Stumpwork by Elizabeth Braun. Design process for a needle lace project by Jean Leader. Net Making from ropeandcanvas (good tools and jigs, and an alternative to the weaver’s knot for adding on). Ayoreo looped bags from Bolivian lowlands in bromeliad fiber. Hansen’s Notation System for explaining the U’s and O’s system of nalbinding instruction. Nalbinding strainers — spinning the hair fiber (I believe) begins at 6:00, stitching the strainer at 7:50, adding thread at 9:39.